I remember my mom setting up her sewing machine on the dining room table and making clothes. 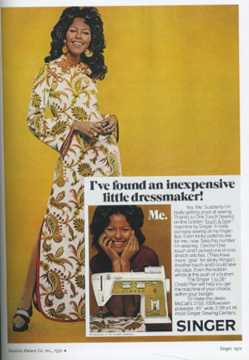 My favorite outfit of hers was a red, white, and blue double-knit polyester halter maxi dress. I think she wore it to every party she and my dad attended in the 70s. It looked awesome with her frosted Carol Brady shag haircut. I learned to sew on my grandmother’s ancient Singer. We would spend winter afternoons creating clothes for my Barbie dolls out of scraps of her double-knit polyester and faux fur. Nana would also create clothes for my sister and me, which we wore with pride. I loved that she could create almost anything without a pattern. When I was older, she made most of my formals for dances. To this day, I still love to sew even though I don’t do it often enough. For me, it’s not only the pride I feel when I’ve made something, but it’s also the challenge of navigating a pattern. The Singer company believed in asserting your design independence. 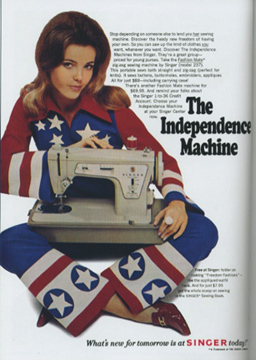 What I love about this ad is that it boasts about how this machine sews straight and zig-zag. In a time before computerized sewing machines, this was big news. With this sewing machine, you could not only sew knits but also create button holes, embroider and do appliques. Sassy! Why, I’m willing to bet you could whip up this lovely red, white, and blue ensemble in no time. Here’s another ad for Singer boasting about their One Touch Sewing feature. This one features nine stretch stitches that are perfect for creating the slinky disco fashions of the era. This lovely confection was created using 100% woven polyester. Yummy! This ad just cracks me up. Here’s a sample of the copy: “If you want to different these days you have a choice. #1, you can look ridiculous. #2, you can look like you came off an assembly line.” Wow. Not much to choose from. Thank goodness the people at Simplicity patterns believe you can choose what you want to wear, like this dress with completely open sides. Yep, the 70s were far from modest. Finally, here’s another Simplicity ad I’ve included just because I love all the designs. I think this one sums up the fashions of the era quite nicely. Next week I’ll take a look at my favorite ads from department stores. 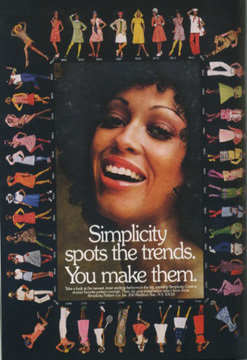 Sears, Montgomery Ward (monkey wards) and JC Penney were all favorites of the 70s.